There are three different Forex charts of use when trading at the Forex market. Let me introduce you to them: Line charts, bar charts and candlestick charts. We have a strong preference for the candlestick charts because they give us the most information. So a chart with just one line the shows us the movement of the quote. Line charts are easy to read and show us the trend in the Forex charts . Also good at use to see the Support & Resistance levels. Allthough the line chart gives us information about the history of the pairs price, it’s hard to see the individual prices. The Bar charts show us individual prices for a certain time period. Every bar has it’s own information and will so give you a more accurate view of you positions. Bar has an open, high, low and closing point. Most traders use the candlestick chart because they tell us a lot of clear information. Especially the Price Action is really recognizable. Don’t get confused, the candlestick shows us the same information as the bar charts, however it’s easier to read. Candlesticks give good information about the highs and lows at a certain timeframe. To make a long story short, without Steve Nison, candlestick charts might have remained a buried secret. Steve Nison is Mr. Candlestick. Want to learn more about Candlesticks? Download the Free E-BOOK! Trading strategy. The difference between a professional Forex trader and an amateur is like a boxing match between an Olympic champion and your neighbor. A professional trader is able to predict the future better due to good strategies that he or she has developed. The professional trader knows everything about risk management and how to keep himself under control and never get emotions the better of him. You’ve got to be strong psychologically to make more and more winning trades. You’re not always going to make winning trades, sometimes you will make a bad one. The art of the game is to minimize your loses and maximize your winnings. Sounds simple right? Keep on reading and you will learn how to do this. “A trader who has never lost, is not a trader yet.” Aristotle. It’s very important to read and be able to analyze the graphs really well. In the end it is all about recognizing patterns that have occurred in the past and may well be happening in the future again. Remember the Forex market is always on the move. It’s like dating. You’ve got to get to know the other person really well to press the right buttons for him or her. In trading technical analysis of a certain pair is really important. Get to know the pair your trading to predict any movement in the future. Ask yourself questions as: What is the price at the moment? What was the price? What happened when the price was at this certain level? The answers on these questions will give you a possible outcome in the future. And so a possible right moment to make your trade. You don’t think this is the only Trading strategy right? Since there are a lot more strategies at use at the Forex market. For example: Drawing trend lines, support and resistance lines, the candlesticks and the different indicators. Every trader uses its own way to analyze the market. Fundamental analysis is also called the old fashion way since it’s used by traders who mainly focus on the economic news. The idea of trading of the economic news is that the currency will follow the economic news. It is certainly important since it can change the prices but more than often the Forex market reacts in a different way as expected. Take the Brexit as an example. This had a bad influence on the value of the GBP. But that doesn’t have to be the case all the time. You will see that traders who trust on fundamental analysis get confused when it goes the other way. Swing trading is, the word gives it a way a bit, trading on a swing. Simply, traders are looking for a pair with a predictable big swing ahead. Swing traders are the hit and run kind of people. They make a trade, get a few percentages profit and close their trade. Most often swing traders are cautious traders. Like a leopard, they wait for the right moment to attack and give it their all when that slightly weak dear is running by. The swing traders work with the Stop-loss that protects you from big loses. More about Stop-loss later on. 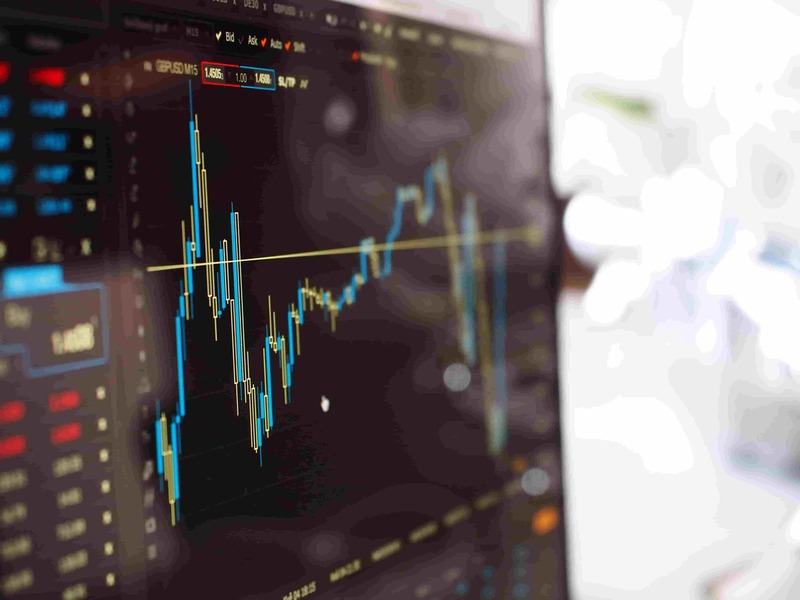 Trading strategy for a trend trader is pretty plain and simple: Make sure you’re there when it happens and stay as long as you can until the trend reveres. Thought of a trend trader is that the price will keep moving in a certain direction otherwise it wouldn’t be a trend right? If the price, unexpectedly moves the other way it’s not a trend and the trend trader gets out of the hot kitchen before he burns his fingers. These particular trading styles can be very successful if you have the right patience and know where to go for the kill. Mostly you will go for the kill at a retracement point. 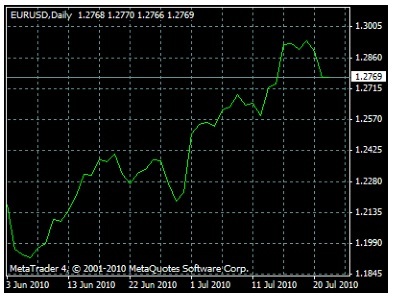 -Up Trend: If the trend goes up the Euro is worth more. -Down Trend: If the trend goes down the Euro will lose in value. -Sideways Trend: Prices move in a narrow range. ⦁ Day trading and Scalping. A common style of Trading strategy is Day trading. Day Traders are traders who strive to make money on a daily base on the Forex market and make as little as 5 to 10 trades a day. Day traders who refuse to hold on to their position for one night work with a real tight Stop-loss and hold on to their good positions. For example the EUR/USD pair is the ADHD kid of the class who can’t sit still and is the pair that moves the most. 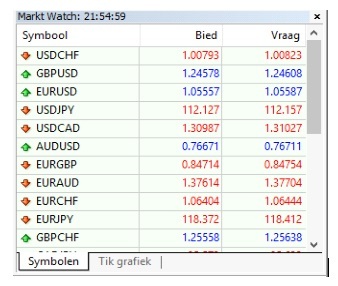 An average of 80 PIPs (More about PIPs in a few moments) a day. So these movements need to be top focus for a day trader. Scalping is a sort of day trading. Scalpers trade in a relatively short timeframe as five minutes. Every trade they make will be between 5-10 PIPs. Imagine going for a 10km walk. And every 10 meter you find yourself a dollar on the ground. You will finish your walk with a $1,000,- in hand. You see, a lot of small trades will end up being a big one. Scalping is for the thrill seekers under us. It requires constant focus. Pick the Trading strategy that fits you as a person. If you like to analyze and wait for the right moment don’t go scalping. Other way around. If you are that thrill seeker, don’t go bore yourself with analysis. If you want to know more about Trading strategy, look at the coursebook!